Investigations will start next year into giving users of Blue Flag beaches immediate warnings of sewage pollution, says Keep Britain Tidy. Cornwall-based Surfers Against Sewage (Sas) said in August that beach users had a right to know about pollution from sewer overflows. Sas said it had identified 35 Blue Flag beaches as failing to do this. 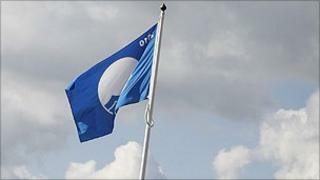 Keep Britain Tidy, which administers the UK Blue Flag scheme, said it was still talking to government officials. The Blue Flag is awarded to beaches that meet "strict criteria" on water quality, environmental education and information, environmental management and safety. Keep Britain Tidy spokeswoman Fiona Ashurst said: "We are in discussions with the Environment Agency and Defra with a view to identifying the location of Combined Sewer Overflows which are in, or next to, Blue Flag beaches. "We will be investigating next year to see where real time warning is required and feasible." Sas says regulations already required warnings during and after pollution from sewer overflows. And it fears that the regulations on sewage warnings could be watered down by the authorities. Sas campaign director Andy Cummins said: "Beach users deserve real time warnings when raw sewage is in the sea, and premier Blue Flag beaches should lead the way with these systems."